Population: 8,482 million (in 2017). 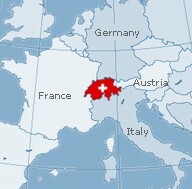 Switzerland is a parliamentary federal state of 23 cantons since 1848. Area : 41,293 sq km. The Alps cover 60% of Switzerland’s surface area. Switzerland has an old tradition in science, and it is among leading countries in scientific research. Switzerland is especially strong in chemistry and biotechnology, and appears regularly in good positions in research rankings (see www.universityrankings.ch) and numerous Swiss scientists have received the Nobel prizes in all scientific disciplines. A list of important institutions and links related to science and research. Most of the people working in Switzerland are employed by small and medium-sized enterprises (SME), which play an extremely important role in the Swiss economy.